This is the first game in the Syndicate series. For other games in the series see the Syndicate category. For the first-person shooter reboot, see Syndicate (2012). 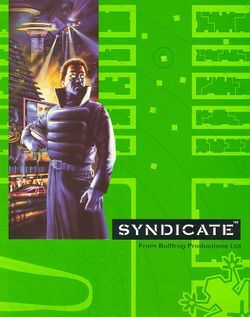 Syndicate is a real-time tactical strategy game developed by Bullfrog Productions and published by Electronic Arts, initially for Amiga and MS-DOS in 1993 with versions for a wide variety of computers and consoles following in 1994 and 1995. Syndicate takes place in a dystopian future where mega-corporations rival each other for control over the population. To assist in maintaining order and control, these corporations enlist "volunteers" (chosen by a draft system) to carry out special tasks to complete to ensure that standard operations of the mega corporation aren't disrupted. The player controls a small division within Eurocorp, tasked with these special missions to further the goals of the company. The game's success led to the release of an expansion in 1993 titled Syndicate: American Revolt, and later a sequel, Syndicate Wars, in 1996. A reboot, simply called Syndicate, was released in 2012. Box art for the PC version via Origin's digital store. This page was last edited on 16 August 2016, at 17:48. This page has been accessed 14,610 times.